Drs. 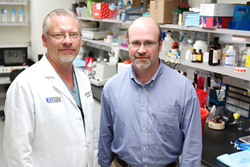 Robert Fenstermaker and Michael Ciesielski of Roswell Park Cancer Institute, co-inventors of the SurVaxM vaccine. Those of us working to help patients with glioblastoma to live longer realize that the gains from existing therapies have been quite limited. The U.S. Food and Drug Administration has awarded orphan drug status to a promising immunotherapy vaccine developed at Roswell Park Cancer Institute. The FDA notified MimiVax LLC, a Roswell Park spinoff company, on Aug. 3 that its application for orphan status for SurVaxM as treatment for glioblastoma, a type of brain cancer, had been approved. Orphan status is a special designation awarded to encourage innovation and exploration of approaches to treat rare diseases that affect relatively few people. SurVaxM, also known as DRU-2017-5947, is an immunotherapy drug that targets survivin, a cell-survival protein present in most cancers. Invented by two Roswell Park faculty members, the vaccine stimulates the immune system to kill tumor cells that contain survivin, a protein that helps cancer cells to resist conventional treatments. A phase II study of SurVaxM given in addition to standard treatment for patients with newly diagnosed glioblastoma is ongoing at Roswell Park and four other institutions: the Cleveland Clinic, Dana-Farber Cancer Institute, Massachusetts General Hospital and Beth Israel Deaconess Medical Center. The vaccine is designed to control tumor growth and recurrence. On the strength of an interim analysis of the in-progress phase II study, the investigators expect to pursue late-stage clinical trials with SurVaxM, pending FDA approval. The vaccine is also being studied in other types of cancer, with a separate clinical study underway looking at SurVaxM as part of combination therapy for multiple myeloma. The vaccine team credits donations to the Roswell Park Alliance Foundation with moving their vaccine research forward. The Alliance Foundation raises funds in support of research and patient-care programs at Roswell Park Cancer Institute, including the current study of SurVaxM in patients with newly diagnosed glioblastoma. For more information about the phase II clinical trial, call 1-877-ASK-RPCI (1-877-275-7724) or send an e-mail to ASKRPCI(at)roswellpark(dot)org. Additional details are available at clinicaltrials.gov/ct2/show/NCT02455557. Glioblastoma is the most common form of brain cancer in adults, with approximately 14,000 cases of the disease diagnosed each year in the United States. MimiVax LLC, is a clinical-stage biotechnology company focused on the development and commercialization of immunotherapeutic vaccines and targeted therapies for cancer treatment. Its lead candidate, SurVaxM, an immunotherapy developed at Roswell Park Cancer Institute, is currently undergoing Phase 1 study in multiple myeloma and Phase 2 study in glioblastoma. For more information, visit http://www.mimivax.com. The mission of Roswell Park Cancer Institute (RPCI) is to understand, prevent and cure cancer. Founded in 1898, RPCI is one of the first cancer centers in the country to be named a National Cancer Institute-designated comprehensive cancer center and remains the only facility with this designation in Upstate New York. The Institute is a member of the prestigious National Comprehensive Cancer Network, an alliance of the nation’s leading cancer centers; maintains affiliate sites; and is a partner in national and international collaborative programs. For more information, visit http://www.roswellpark.org, call 1-877-ASK-RPCI (1-877-275-7724) or email askrpci(at)roswellpark(dot)org. Follow Roswell Park on Facebook and Twitter.